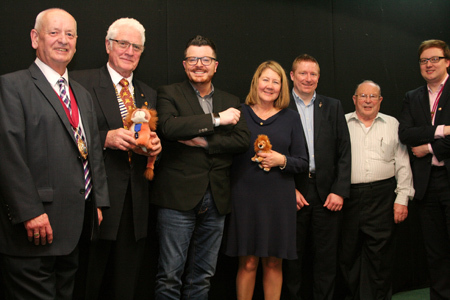 Quote from a guest - "Probably the best thing Lions Clubs have done for some time"
two members of Nuneaton Round Table, which now incorporates Bedworth Roundtable. Round table increased the prize pot by a very generous �00 - Thank you! 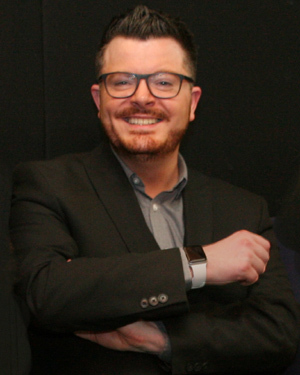 The evening was hosted by Brody Swain, BBC-CW presenter. 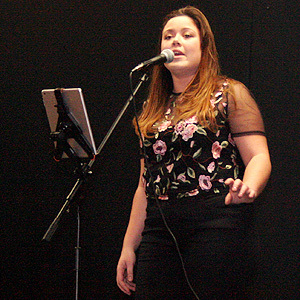 Musical entertainment was provided by Ella-May Stanier, who was sponsored by the Weaver抯 Arms, Bulkington. 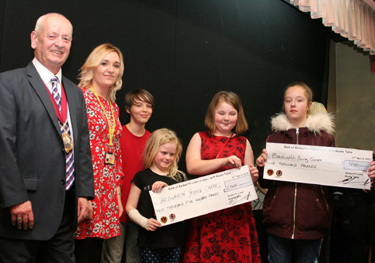 Nuneaton and Bedworth Deputy Mayor Bill Hancox, was the honoured guest, presenting awards. 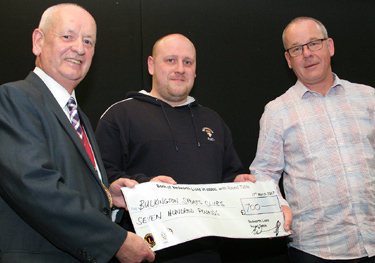 Bulkington Sports Club received a total of �0 to help improve their facilities. 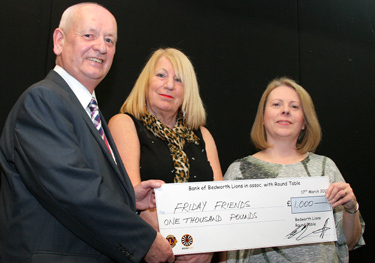 Friday Friend抯 Dementia Caf�, based once a month in Bulkington Conference Centre were awarded �00 to enable them to purchase instruments and equipment for musical therapy. 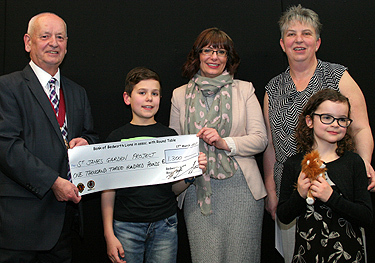 St. James Academy, Bulkington were given �00 to build a bridge/dipping platform for their wildlife garden. St Michael抯 Children抯 Centre, Bedworth, received �00 helping to extend their community caf�. 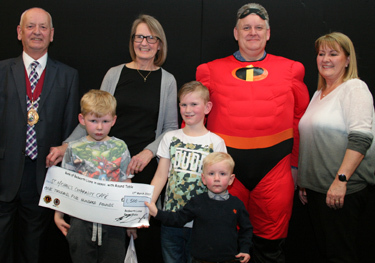 Warwickshire Young Carers received the top prize of �00 to take a group of young carers on a residential break. 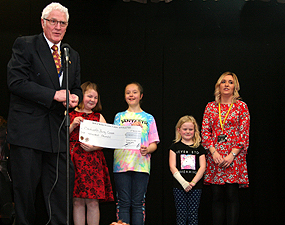 Also Lion President Eric gave an additional �00.00 to help the children in their role as carers, recognising their invaluable work. It's not not all about money. 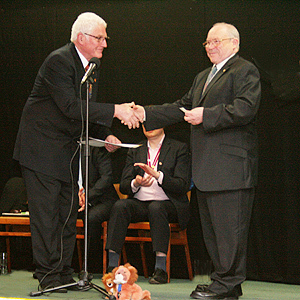 Lion Brian, for once lost for words, receiving a chevron denoting 25 years service to Lions clubs. We can smile now it's over & a success. 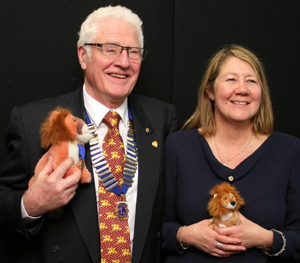 This event probably would not have taken place without the input from, at the time, our newest Lion, Lion Denise, and the confidence of Lion Eric driving it along. FANTABULOSA! A big THANK YOU to all who helped make this the super event that it was. Those who didn't quite make it to the finals better luck next time. And finally - Yes! a certain Lord was at the event as promised, did you spot him?